Bangalore- 13 November, 2013: VasudevAdiga's, a popular chain of restaurants in Karnataka, has committed to raise funds to support The Akshaya Patra Foundation, an NGO which serves mid-day meals to government school children in India. VasudevAdiga's aims to fund one million meals in collaboration with its customers, partners and employees. This campaign, titled '+1', is slated to be launched on Children's Day, November 14th, 2013 and will roll out across 20 outlets in Bangalore and the rest of Karnataka. The price of every item on VasudevAdiga's menu will be increased by Re 1 and the proceeds will be donated to The Akshaya Patra Foundation. "Our +1 campaign aims to bring together our customers, partners and employees in achieving the ambitious goal of helping The Akshaya Patra Foundation to provide a million meals. We hope to demonstrate the collective power to do good by just giving 1 extra rupee. We hope this campaign will inspire our customers while helping nourish the dreams of many children across the country", said Mr. Jacob Kurian, Managing Director, VasudevAdiga's. 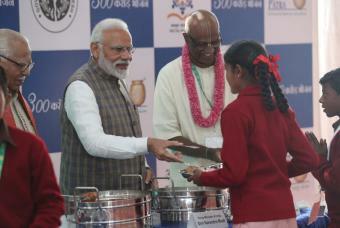 In a public-private partnership with the Indian government, The Akshaya Patra Foundation serves the largest number of hot, freshly-cooked school meals in the country on all school working days. Reaching out to around 1.3 million children in 20 locations across 9 states of India, Akshaya Patra is now the world’s largest NGO-run school meal programme. Speaking on this occasion, Mr. ShridharVenkat, Executive Director, The Akshaya Patra Foundation said, "This partnership will support many deserving children of our country in their endeavour to realise their dreams and true potential. We are extremely happy to have collaborated with VasudevAdiga's under their +1 campaign which hopes to reach out to many such children, helping us take a step closer to ensuring 'No child in India shall be deprived of education because of hunger'. VasudevAdiga's Fast Food Limited is one of the leading multi-unit restaurant companies in Bangalore. It has a robust corporate and event catering business as well. With twenty outlets including the newly opened outlet in the popular temple town of Kollur in west Karnataka, Adiga’s serves the common man as well as the corporate executive with a range of affordably priced, freshly prepared pure vegetarian comfort food.